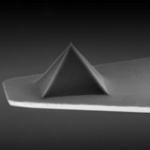 The Pointprobeï¿½ is a versatile silicon AFM probe for very high resolution imaging and fits to all well-known commercial SPMs (Scanning Probe Microscopes). 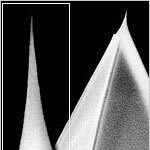 It consists of a single crystal silicon cantilever with integrated single crystal silicon tip. The cantilever and the tip are supported by a single crystal silicon holder. True atomic resolution has been achieved by several research facilities in UHV using the Non-Contact / TappingMode AFM probes NCH and NCL. Resistively is as low as 0.01-0.025 Ohm*cm.